This year Attached Moms is presenting a simplified holiday time. It is easy to overindulge in both food and presents during holidays. While for me, I love to give, giving too much can take away from quality time and mean I spend too much money and not enough time. 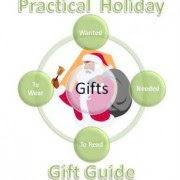 This year, to help guide my readers, we're focusing on the more practical holiday gifts. Enter to win some great events and support our sponsors! Giveaway is open to US only and ends on November 22,2012.